Many people allow their term life insurance policies to expire once their children are grown. 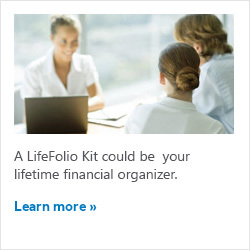 This may not be a good idea, especially if you have other bills and your spouse would need continued financial support. But a new term policy can be quite expensive when you are older. Survivorship life insurance may be a more cost-effective solution. Survivorship life insures the lives of two people, typically a married couple, and pays a death benefit after the death of the last-surviving covered person. 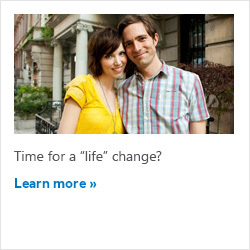 For this reason, it is sometimes called second-to-die insurance. 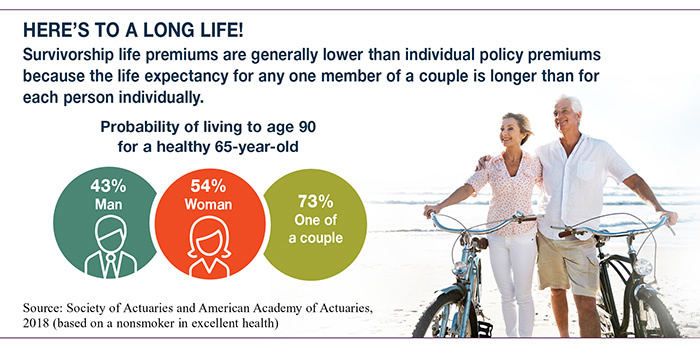 Because only one death benefit is paid and premiums are based on the life expectancies of both insured individuals, the cost is usually less than premiums for a policy covering either life alone. And it may be possible to obtain coverage for a spouse who has been rejected for an individual policy. Survivorship policies are also used to insure business partners, and options may be available to insure more than two people. Survivorship policies are typically permanent life insurance, which offers lifetime coverage and stays in force as long as you pay the premiums. The death benefit of a survivorship policy could be used to leave a legacy for your heirs, pay taxes, settle an estate, and pay other end-of-life expenses. A portion of the premium goes into a cash-value account, which accumulates on a tax-deferred basis throughout the life of the policy. Any cash value accumulated at the time the first spouse dies might be used to help support the surviving spouse. Of course, loans and withdrawals will reduce the policy’s cash value and death benefit. Withdrawals of the accumulated cash value, up to the amount of the premiums paid, are not subject to income tax. Loans are also free of income tax as long as they are repaid. As with most financial decisions, there are expenses associated with the purchase of life insurance. Policies commonly have mortality and expense charges. The cost and availability of life insurance depend on factors such as age, health, and the type and amount of insurance purchased. Any guarantees are contingent on the financial strength and claims-paying ability of the issuing insurance company. Before implementing a strategy involving life insurance, it would be prudent to make sure that you are insurable. What is the future value of an annuity? Financial advisor David Hannon is an Agent licensed to sell insurance through New York Life Insurance Company and may be licensed with various other independent unaffiliated insurance companies in the state of [WA, TN. CA, (CA Insurance License 0M14545) AK, TX, and NV]. No insurance business may be conducted outside this state/states-referenced. Financial advisor David Hannon is a Registered Representative of and offers securities products & services through NYLIFE Securities LLC. 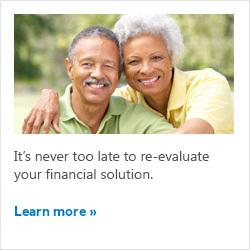 Member FINRA/SIPC, a registered broker-dealer and a licensed insurance agency. In this regard, this communication is strictly intended for individuals residing in the state(s) of (TX and NV). No offers may be made or accepted from any resident outside the specific state/ states referenced. David Hannon is also a Financial Adviser with Eagle Strategies LLC, a Registered Investment Adviser, and a wholly-owned subsidiary of New York Life Insurance Company, offering advisory services in the states of AK and NV. As such, these services are strictly intended for individuals residing in said states.